In 1793, the new Republic of France shook Europe by defeating the armies of Austria, the German States and Britain with an army largely composed of conscripts. With the fall of Holland to the French, the British had to evacuate the continent and was faced with invasion. This led to concerns among the people of Kent who felt themselves in the front line of any threatened invasion. In March 1794, the Government accepted their offers to form Volunteer Cavalry to assist with the evacuation of the civil population and livestock from any affected area and to act as guides to other troops coming into the county. 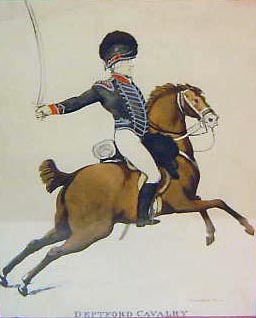 They were to be known as Gentlemen and Yeomanry Cavalry. The Gentlemen were the officers provided by the aristocracy and landed gentry of the county.